As the founder of The Singletons, I have always referred to the organization as my fourth child. The Singletons, just like any child, has brought me a countless amount of proud “mama” moments, a few tears and an endless amount of hope for the future. I believe, “It takes a village to raise a child”. The Singletons is a unique organization built on the simple concept of supporting each other through life’s struggles. We are an innovative organization whom focus on day-to-day needs that people take for granted, as well as the emotional and financial stress of facing cancer. The Singleton’s vision of being the village that raises a family out of desperation and despair has endured. Raising a family has its challenges regardless. Raising a family as a single parent amplifies the stress. Add a terrifying cancer diagnosis into the mix, along with exhausting treatments, all the while trying to raise a family as a single parent is nearly impossible. The strength our Singleton Families radiate is truly inspiring. They are the heartbeat of the organization. Other organizations may address one of these issues, but none provide the programs to address all of these intertwined areas of life, nor do they focus on the single parent population. Over the course of a year, a Singleton Family will have the opportunity to receive $5,000 in assistance through programs such as; utility bills, family style dinners, restocking of household necessities, Holiday gifts and fun family activities. This is UNPARALLELED support! Although it is no easy task, we rely completely on the generosity of individuals, groups and corporations in our community. In 2018, adjustments and cuts to our one-of-a-kind program operations had to be made. However, the need continues to grow. I have always tried to find the bright side of a situation but this has to be said, “We have had a difficult go of it lately!” Since the organization’s inception in 2006, the last 18 months have proven to be our most challenging. Donations have been historically low. Your charitable gift to The Singletons will help single parent families battling cancer in Arizona today and it qualifies for the Arizona Charitable Tax Credit (QCO Code: 21020). 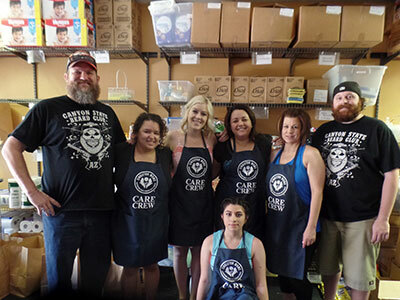 ADDITIONALLY, by making your Arizona Charitable Tax Credit through the Executive Council Charities and their Support Arizona Youth (SAY) Campaign; www.ec70phx.com/Ong-Singletons. They will match 25% of your donation to The Singletons. Now your gift is MAGNIFIED! I am endlessly grateful for your generosity! The Singletons would be unable to give the love, support and caring nature our programs provide if not for you. Together, we are…. Meeting the Needs of Today…. Providing Hope for Tomorrow! Start Planning Your Tax Credits Now! It’s official! The Singletons is now listed as a Qualifying Charitable Organization with the state of Arizona!! This means AZ residents can make a donation to The Singletons and get it back from the AZ Dept. of Revenue (up to $400/ individuals or $800 if filing jointly on AZ tax return). You can help support single parent families with cancer, and it may cost you nothing, thanks to the Arizona Charitable Tax Credit. You make a donation to The Singletons of any amount (up to $400 if filing singly or $800 if filing jointly for your Arizona taxes). Simply complete AZ Form 321 and include it when you file your Arizona taxes. This tax credit is allowed in addition to the education and foster care credit, you can contribute to all three! No. You can fill out the short form (AZ Form 321) and still claim the credit. You must make your donation on or before April 15, 2019 – to be applied to the 2018 tax year. You can donate online using our one time donation form. Or mail your check to The Singletons, 2501 W Behrend Dr., Suite 1. Phoenix, AZ 85027. We will mail you a donation receipt for your records. If you have any questions, please call us at 480-818-5285. 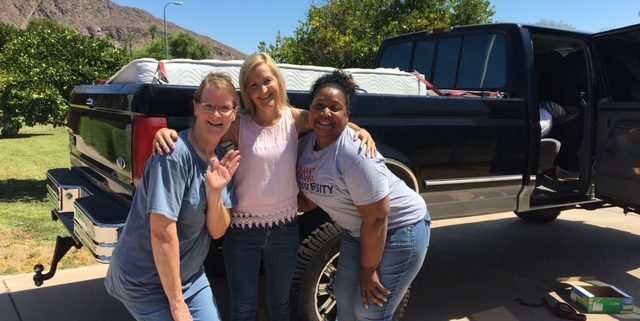 Singleton “Mom”, Theclia, can sleep well tonight thanks to a generous bed donation and a willing volunteer with muscles, a truck, and a kind heart! 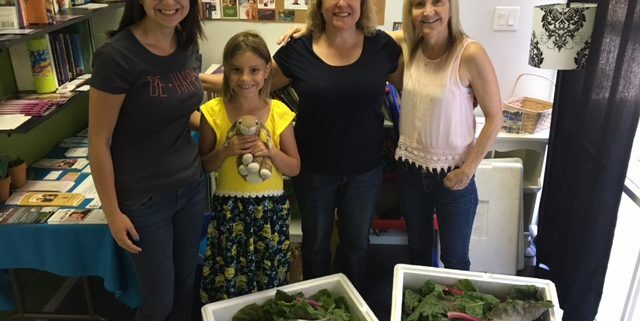 Birthday girl and sister of Singleton “Mom” Claudia Flor Alvarado, encouraged her friends and family to donate to Singleton Moms’ Bare Necessities Cupboard in lieu of birthday gifts. Chris Williamson from Webster Willeford Farms has been supplying Singleton families with fresh organic Swiss Chard. Our parents have been so grateful to have nutritious veggies to eat and juice. Way to grow, Chris! 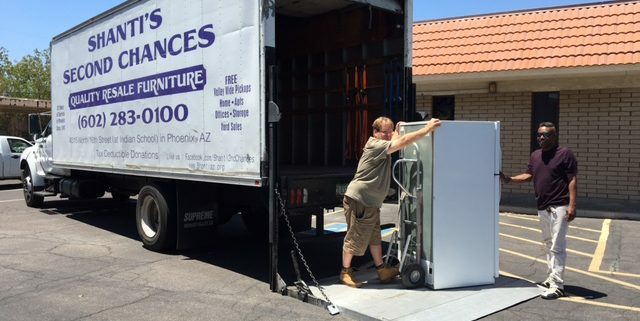 The Phoenix Shanti Group generously donated & delivered a refrigerator to Singleton Moms! Check out their thrift shop, 2nd Chances in Phoenix for treasures like this and more. Thank you Shanti! You can visit their website www.shantiaz.org. Hairstylists, Adrienne and Stephanie opened their salon, L’Mage Studio for Singleton kids on Easter Sunday. https://www.thesingletonsaz.org/sing-content/uploads/IMG_0618-e1459804888261.jpg 4032 3024 Singleton Moms https://www.thesingletonsaz.org/sing-content/uploads/The-Singletons-Logo-sm.png Singleton Moms2016-03-29 14:10:372016-04-04 14:22:54A cut above! Thanks Katie Blik for your Bare Necessities Drive! https://www.thesingletonsaz.org/sing-content/uploads/Katie-Blik-BN-Drive.png 320 850 Singleton Moms https://www.thesingletonsaz.org/sing-content/uploads/The-Singletons-Logo-sm.png Singleton Moms2016-02-26 17:15:592016-03-01 17:31:30Thanks Katie Blik for your Bare Necessities Drive!